Mauna Loa ~ Days 41, 42 & 43...It's DONE! The base is made with bezeled Lava beads and free form/sculptural peyote stitch with matte, opaque and AB black seed beads in size 8/0, 11/0 (round and triangles) and 15/0.There are also black AB Czech Fire Polished beads 3mm and 4mm. 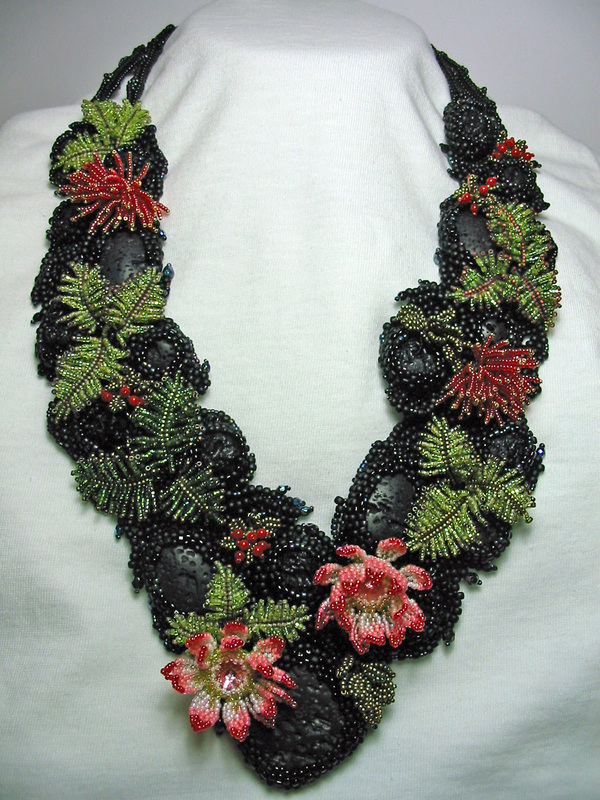 The embellishments (Ferns, Proteas, Ohia Lehua flowers and leaves, Ohelo berries and leaves) are all done with size 15/0 seed beads, a few Delicas and a few gold plated Charlottes. The Ohelo berries are 3mm round coral beads and the centers of the 2 Proteas are 12mm Swarovski Rivolis. Holy cow woman... that is GORGEOUS!!! The close up shots are amazing. Really nice work! Need to go back and look some more. Congrats on finishing it. Simply amazing really. James and I are just blown away. it is so beautiful really. 200 hours and well worth it. I must say this is by far your best work yet. The skill and time that went into it just woa. Thankyou for sharing such a lovely pice of art, It truly does shadow the artist herself. Thank you guys! :-) I'm glad you like it. Oh, my liiving stars!!!! Saby, it's beyond gorgeous!!! Wow!! 200 hours of work made something priceless. You are amazing! Thank you for sharing the pictures and the journey with us. You definitely deserve to do something for instant gratification now! I'm so glad you enjoyed the journey! Oh wow. Just wow. This is just excellent, and I'm sure more amazing in person. I love all the texture, and the ferns and flowers are just perfect with the contrasting black lava. Thanks for sharing it with us! I loved working on this piece, it brought me back to the amazing time I had visiting the Volcanoes National Park. This is simply GORGEOUS!!! I'm totally amazed! You've outdone yourself here, girl!! Seriously - this is a total masterpiece! WOW! My oh my Saby, this is a real work of art! Everything is so realistic, I love all of the flowers.. ABSOLUTELY WONDERFUL !!!! I love it ! Merci beaucoup, Frany! :-) I'm so glad you like it. Absolutely stunning. Would love to see this up close and personal. I have followed this piece from it's conception when you first talked about it on Bead Art. It surpasses what I had imagined it to look like. You need to enter this into the Beaddreams contest. It surely is a winner. Awww, Illaya, thank you so much for following this project and for your kind words! I'm so glad you like the way it turned out. Entering a piece into the Beaddreams contest would be too much of an hassle for me, since I don't live in the US. The photos are not enough, they require the piece itself and between the cost of shipping with a reliable courier, the insurance, the chance of getting charged by our custom on the way back, the risk of damage/loss during the show and the fact that they would keep it for months....nah, not for me. what a wonderfull necklace!!! !, your beadwork is really incredible. I love it. Awsome & Taking my breath away. Thank you Saby very much for your beautiful website, you're sharing with us so beautiful things. I am so touched by your generosity. With Kiss & all my best wishes for the New Year 2009. I forgot about all the hasels it would involve Saby. You are not only an outstanding teacher and beader but a humble loving person. Your accolades and rewards will be far reaching. Dear lady... that is ART!!! WOOW!! !